Address thinning hair with the Spectral-F7 from global leaders in developing high performance personal care products, DS Laboratories; a targeted hair follicle booster formulated for men and women who want to support their efforts in overcoming premature hair loss. Using newly published research of the stress hormone blocking peptide Astressin-B known for its hair loss fighting properties, the formula is enriched with a cocktail of Amino Acids, Proharin-ß4 and Copper peptides, helping to speed up growth, stimulate keratin production and activate hair follicle stem cells, whilst increasing the diameter of the hair shaft. With consistent use, users may notice a fuller, stronger and healthier-looking mane. Shake the bottle well before use. Each dose of Spectral.F7 consists of 10 sprays onto the head, concentrating on any particularly thinning areas. It works particularly well as a means to enhance primary therapies such as Spectral.DNC-N where you can simply spray and massage into your head after your morning treatment or before your treatment in the evening. Always ensure you wait 10 minutes in-between products. 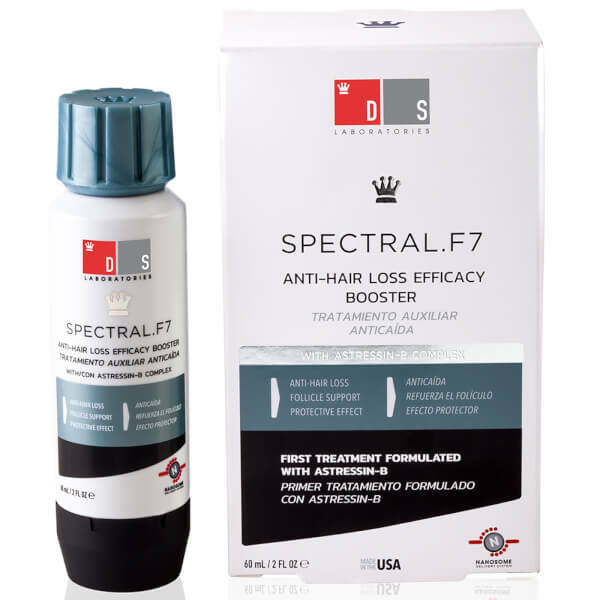 Spectral.F7 (astressin-b) is also great to use as a stand-alone product, for best results use in the early onset of thinning in the morning and the evening.